My SCK seems to be maflunctioning. I can tell it’s connecting to the wifi (checked that it’s registered when I log into my wifi at home) but no data posts to the site and my kit appears offline. 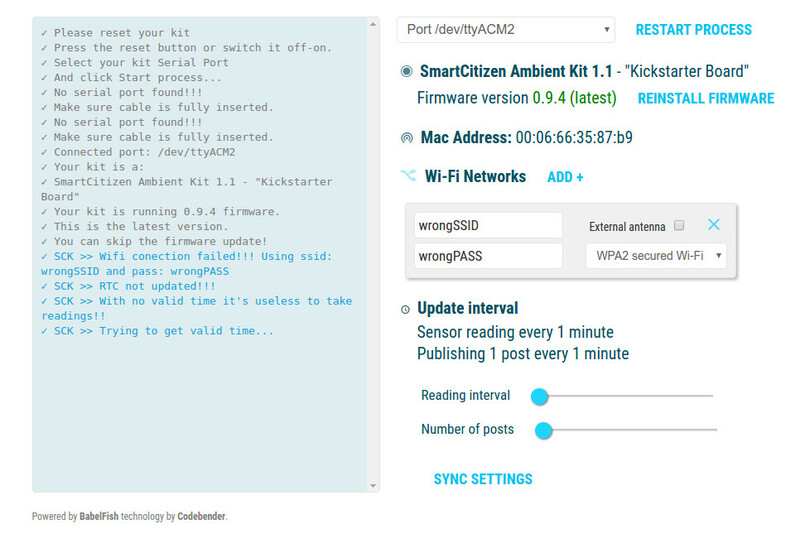 I tried doing firmware re-flash and adding the wifi networks again. No dice. What can I check next? 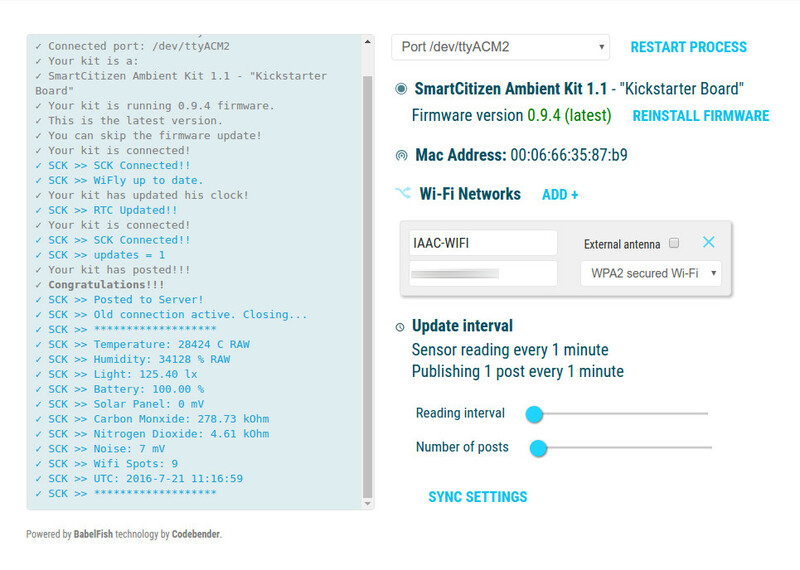 ✓ Your kit is connected to WI-Fi! ✓ SCK >> SCK Connected to Wi-Fi!! ✓ Your kit has updated his clock!  ✓ SCK >> RTC Updated!! How can I fix this? Is it Wi-Fi related? The solar panel should fulfil the specification of a voltage bigger than 8v and less than 15v, 12v is the recommended voltage, and a minimum of 500mA. For sunny regions 10W 12V is absolutely enough and will suffice over a whole years period (e. g. https://www.amazon.es/ECO-WORTHY-controlador-batería-Caravan-cualquier/dp/B013TYJ2IE/ref=sr_1_1?ie=UTF8&qid=1475572481&sr=8-1&keywords=solar+10w). For other, more northern regions, you might get problems with above mentioned type in the winter months, which is why we opt for a 20W 12V type (e. g. https://www.amazon.es/ECO-WORTHY-Bombilla-policristalinos-cargador-batería/dp/B0140OOC6O/ref=sr_1_1?ie=UTF8&qid=1475572485&sr=8-1&keywords=solar+20w). I hope this helps. Let me know if anything is unclear.